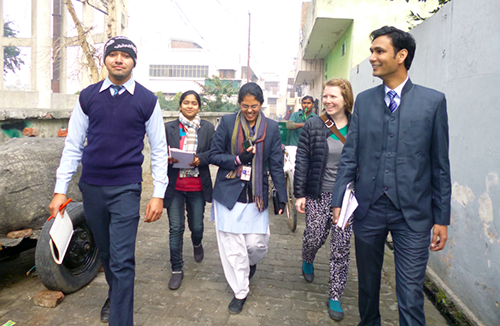 Over the course of two weeks in January, seventy people from MIT and the Shri Ram Group of Colleges researched the waste management system in Muzaffarnagar, Uttar Pradesh, India. Our focus was on understanding the magnitude and types of solid waste produced by households and businesses. Contribution of the Informal Sector: Documented and quantified the contributions of Kabadiwalas (vendors who buy recyclables) and ragpickers (waste pickers who collect recyclables from dumpsites throughout the city). Bulk Generators: Investigated how bulk generators, including banquet halls, restaurants, and colleges, dispose of their waste. Compost Processing and Market: Interviewed farmers and mapped the current compost process to gauge the market potential and to identify opportunities to improve the current process. System Analysis and Overview: Considered all the actors in the system and helped to design a pilot program to be implemented over the next year. My team focused on households. One of the key challenges in any municipal waste system is that often people know neither how much is generated at the city level nor the breakdown by each category of producer (households, bulk generators, and small businesses). Most of us, myself included, have no idea how much waste we produce on a daily basis. Attempts to estimate the per capita generation of waste, such as in this paper, are derived by estimating the total amount of waste collected in a city divided by the city’s total population. 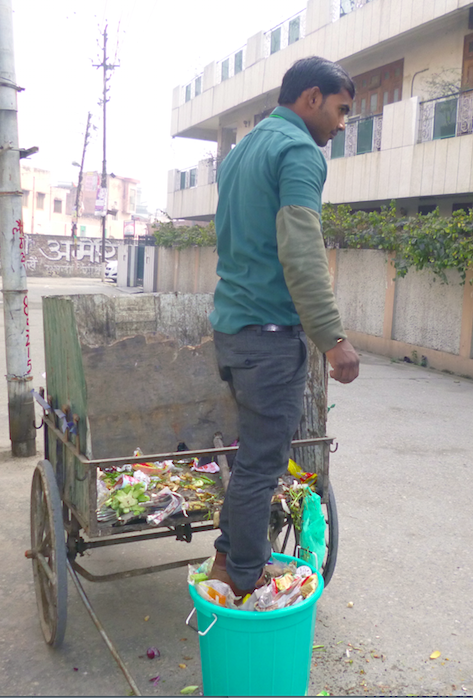 In Muzaffarnagar, where not all waste is collected, this method does very little to help quantification efforts. Currently, about 120 metric tons of waste is gathered through the municipal system daily. This total includes privately contracted door-to-door collectors, municipal street sweepers and anyone else that uses the 45 secondary collection sites throughout the city. During these visits, I began to understand the steps that comprise the waste collection system. Collectors, who visit about 200 households daily, use a tricycle cart to go from house to house. Announcing their arrival with a whistle, they invite households to bring out their waste. Some households drop it from the roof, others use ropes affixed to buckets that are then lowered down four floors to the cart. The remainder simply hand the waste collector a bucket. After collecting and sorting, we calculated that on average, at the household level, a single person in Muzaffarnagar creates 0.315 kilograms of waste daily (this excludes, what gets salvaged through door-to-door household recycling efforts). At the aggregate level, on any single day, in this city with a population of more than 392,451 people, households alone produce more than 123.5 metric tons of waste daily. That is equal in weight to more than 25 Indian elephants. Given that 120 metrics tons are collected every day, there is, at minimum, 3.5 tons that are not being collected on a daily basis. Of course, because households are not the only waste generators in the city, the 123.5 metric tons represent only a portion of the city’s daily waste. Beyond understanding the amount of waste generated, the next question we considered is what type of waste is generated? Knowing both of these variables helps us to tweak the existing system to meet the demands of each stakeholder. Through sorting, we found that roughly 60% of household waste is organic, that translates to about 73.5 tons citywide. Not all of this makes it to the municipal processing site as some of it is consumed by animals – pigs, cows and dogs – at the secondary waste sites. One opportunity that part of our team is exploring further is compost production. Muzaffarnagar is in a predominantly agricultural part of Uttar Pradesh; agriculture could be a natural fit for reusing the valuable compostable material made by various waste generators throughout the city. Our next step is to develop a pilot model that would aim to (a) collect more total waste, (b) encourage households to sort waste at the household level, and (c) explore whether sorted waste contributes to higher quality compost. Through this pilot, we’ll start to explore what types of modifications are needed to encourage behavior change at the household level. Also, we will see whether households are willing to sort their waste without any additional external incentive beyond being provided with the appropriate infrastructure for collection. This will be useful in determining whether it is possible to get a regular supply of organic waste. Finally, the pilot will allow us to test how a clean supply of organic waste influences the market. Do farmers actually want to use compost? If not, are there other venues for organic waste? Post & Photos by Kate Mytty.